The Big Player is the blackjack winning strategy of team play invented by Al Francesco: this person is considered to be the Godfather of Blackjack as it was he who developed the team card counting. After reading the books of such blackjack gurus as Edward Thorp and Lawrence Revere, Francesco had understood he should invent something new to make it easier and more understandable for average players to win money in casinos. One interesting incident had happened in 1971 which gave a birth to the concept of Big Player; Al Francesco was in the Lake Tahoe casino together with his family: his brother, sister and her husband. Al’s brother was familiar with card counting and he used it when played blackjack: he made low bets of $1 or $5 and Francesco did not even pay much attention towards the game as he communicated with his brother-in-low then. Anyway, when his brother made a bet of $5 Al Francesco put his $100 as a bet and he put nothing when his brother bet $1. When the game was finished, the dealer came to Francesco and asked him to continue playing: Al was just a rich person for him who did not pay much attention towards the game itself but was ready to bet much money. Such an incident gave Al Francesco the idea of blackjack team play. First, Al Francesco had three-four people as a team: one of them was the big player and other ones were counters. 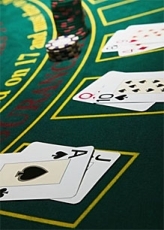 The counters sat at different blackjack tables and made low bets; when it was a good moment to make a considerable bet a counter signaled a big player to come and make big bets till the time he was lucky to win. As soon as it became useless to continue making big bets, a big player left the table with his winnings; he was thought to be a simple wealthy person who did not understand the game much but just made bets spontaneously. A little bit later, Al Francesco had already 7 people at his blackjack team; it was impossible for casinos to disrobe such a strategy but nothing is endless in our world. In 1977, the former member of Al Francesco’s blackjack team Ken Uston wrote the book The Big Player where he told everything about the concept of blackjack team play and scheme used by Al Francesco and his people. Well, after The Big Player publishing, Al Francesco was banned from casinos together with his blackjack team, and his career of blackjack player was finished. Anyway, he was not angry at Ken Uston; Al’s concept of blackjack team play was used by many famous blackjack teams afterwards: the MIT Blackjack Team, the Greeks, the Hyland team etc. Today Al Francesco does not play blackjack anymore and devotes himself to his other passion – horse-racing.